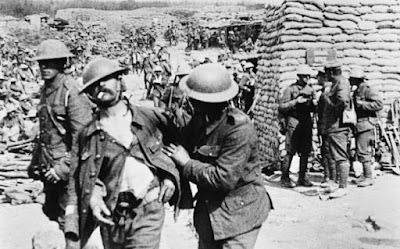 A shell shock victim staggers back from the front and needs help to work. Private Arthur Hubbard, a clerk from Streatham in south London, went over the top at 7.30am on 1 July 1916, the bloody first day of the Battle of the Somme. What he experienced over the next few hours changed him forever. He and his unit, the 14th London, a Pals Battalion, got into the German lines that morning. They had orders not to take prisoners. When three wounded Germans, badly bleeding, emerged from a dugout Hubbard finished them off. Then a British officer was shot by a sniper as he stood by him. Later that afternoon as he withdrew to the British lines, a mass of soil from a nearby shell buried him. His mates eventually dragged him out and back into the lines. Hubbard’s family next heard from him in a convalescence hospital in Ipswich. He told his mother not to worry, that he was a bit shaky and suffering from 'severe headaches’ but otherwise he was fit and well and would make a quick recovery. Unfortunately Private Hubbard did not recover. If the daytime was bad enough, at night it grew even worse. Victims would whisper to Steadman, 'The dreams sir, I dare not go to sleep because I dream so of…’ and he would describe the horrific sights he has witnessed, of mates being blown to pieces alongside, of being buried under debris during one of the massive bombardments.